Love is in the air! 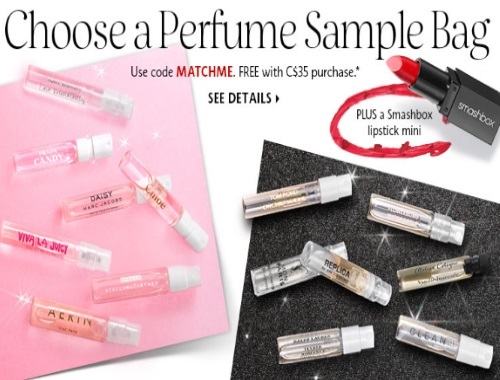 Sephora is offering a Free Perfume Sample Bag and Smashbox lipstick mini with any $25 online order right now to celebrate Valentine's Day coming up! Enter the promo code MATCHME at checkout to get this offer. Choose from two perfume options: a Fresh flirtation (sparkly fragrances for a dreamy afternoon) or An Air of mystery (sultry scents for a starry-eyed rendezvous). Plus get 3x the Beauty Insiders points on fragrance purchases in-store and online until February 14.